What Is a Girth on a Horse? A girth is a very important addition to your saddle. Without it, your saddle is of little use. A girth is a broad strap of material like webbing, leather, or cotton that goes around the horse to secure the saddle onto the horse’s back. It attaches by buckles to the billet straps of an English saddle, goes under the barrel of the horse just behind the elbows, to another set of buckles on the opposite side of the horse. When tight enough, it prevents the saddle from slipping sideways, backward or forwards. Without one, it would be very difficult to keep the saddle on the horse. Girths are made of many different materials or combinations of materials. They come in many lengths, widths, and styles. Some are made for specific purposes like jumping or dressage. They have buckles on both ends so they can be attached to the saddle, and adjusted so they are tight enough to hold the saddle on, but not so tight that it will pinch the horse. Choosing a girth outlines the many types of girth available so you can find one that is safe and comfortable for you and your horse. A girth must never be made of any material that could break easily, and it should always be in good condition so that no part gives way when strain is put on it. It should also be comfortable for the horse, and not cause injuries such as girth galls. If the girth does cause galling, soft girth covers of quilted fabric or fleece might be used to protect the horse’s skin. Or, a shaped girth may relieve pressure that causes galling. In normal riding, it is usually sufficient to use only a girth. However, where the horse changes direction, such as in playing polo, is jumping or must travel up and down steep terrain, a girth might not be sufficient to keep the saddle in place. Under these circumstances, a crupper that straps to the rear of saddle and loops under the tail, and a breast collar or breastplate that attaches to the front of the saddle and loops around the horse’s chest might be useful. These will prevent the saddle from sliding backward and forwards, and help prevent the saddle from slipping sideways. In some cases, a second girth called an over girth that wraps right around the horse, and over the saddle may be used. 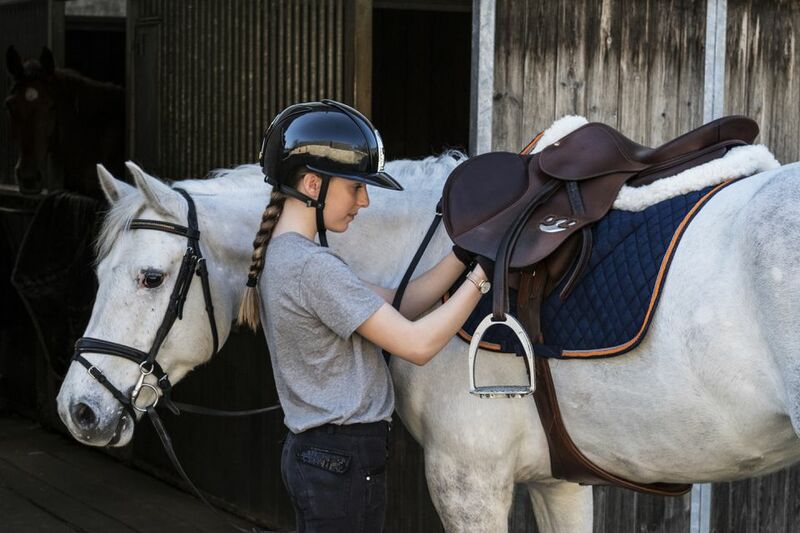 For ponies and horses with very flat, round backs a crupper and breast collar in addition to the girth can help secure the saddle. Because a girth is such an important piece of equipment it should be checked frequently and repaired if possible. Good quality leather girths can last decades with regular cleaning and repair. Synthetic girths can wear out faster and should be replaced more often. Also Known As a cinch. Western saddles do not have girths, but cinches. Examples: To prepare for the jumping at the horse show, she tightened the girth so the saddle would not slip.